There are lots of drones out there for hobbyists and professionals, but few for the prosumer market that eclipses both. What if you want a quadcopter that can shoot professional-grade video at a comparatively affordable price? 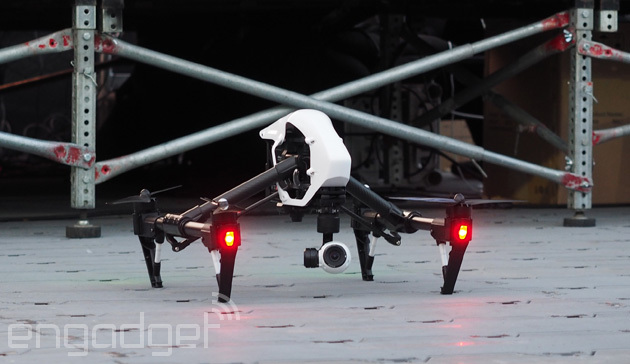 You might want to take a look at the DJI Inspire 1 -- it's a $2,899 drone with a stabilized 4K camera, retractable landing gear and a badass new design. Truth be told, that would be a pretty expensive upgrade from the Phantom 2 Vision, but DJI packs a lot into the Inspire 1's sleek white chassis. The Inspire One rocks a three-axis gimbal mounted camera capable of shooting 12 megapixel images and 4K video at 30, 25 and 24fps. The default camera ships with a 94-degree field of view, but if you don't like it, you can change it. "It's actually a modular camera that you can pop on and pop off," DJI's Michael Perry told us. "It will eventually support different payloads, but for now we just have the one 4K camera." That's not the only imaging device on the rig, either: the Inspire 1 also uses a stereoscopic "optic flow" camera to help stabilize the drone. "It stabilizes itself without GPS," Perry explains "That's important because a lot of people will take off without getting a full GPS lock." A lot of the Inspire 1's best features come out when you look at the drone's controller: a dual-stick remote outfitted with enough toggles and switches to independently control the gimbal and camera settings mid-flight. It's also the pilot's window to DJI's patent Lightbridge, a wireless HD transmitter that provides a live feed from the drone's camera. That feed can be viewed on a smartphone or tablet over USB, or output directly to a monitor or recording device from an HDMI port on the controller's backside. DJI wouldn't let us fly the device just yet (apparently the software still needs to go through some tweaks before it's ready for amateur pilots), but told us that its 6-cell battery will keep it aloft for about 18 minutes. The base unit ships with one controller for $2,899, but DJI will throw an additional remote for an extra $500 -- allowing the Inspire 1's camera and flight controls to be shared between two operators. There's no need to have a third remote lying around, but folks looking for a spare can pick one up for $650. The Inspire 1 is still pretty pricey for the average drone enthusiast, but it's a solid compromise for folks who can't decide between the DJI Phantom 2 Vision+ and the professional S900 and S1000 drones. Thinking of stepping up your aerial camera game to the "prosumer" level? Check out the source link below -- pre-orders start today.